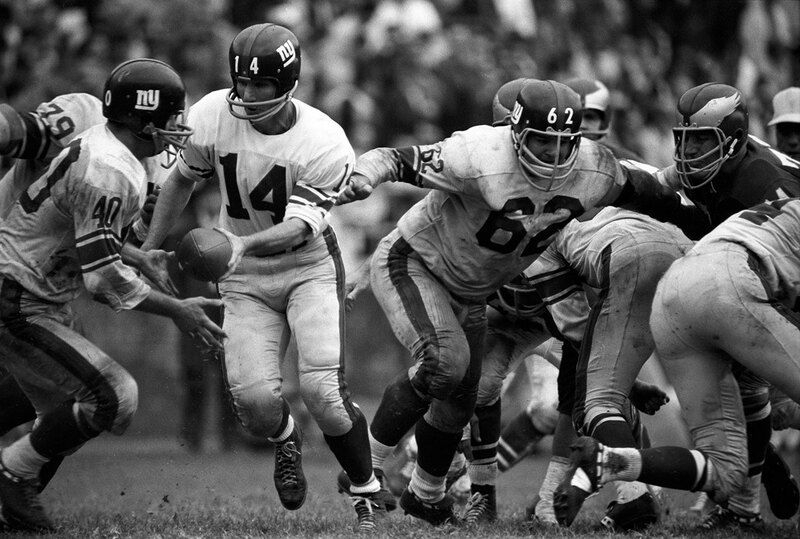 For the New York Giants it might as well be 1962. After a shaky start they are growing stronger and stronger and, coming into the stretch, they are even with the apparently fading Cleveland Browns. And this year the Giants are still depending on a bald, 37-year-old Texas-reared insurance salesman from Palo Alto, Calif. to move the ball for them. A year hasn't changed him much—just made him a better football player, as he demonstrated once again in Sunday's 42-14 triumph over the Philadelphia Eagles. He threw for three scores to bring his season's total of touchdown passes to 23. Yelberton Abraham Tittle knows he has a lot to learn about selling insurance and thinks he has a lot to learn about playing football. But to some 35 million pro football fans, Y.A. is the best quarterback in action today. Whether selling insurance or playing ball, Tittle is a serious man; he is also something of a mystic about football. "After every game people ask me questions about how I figured the other team," he said the other day in his still-lingering Texas accent. "You can't answer the questions. There isn't any answer. It's a matter of feeling. You have to be in this league a long, long time before you get the feeling. I can't say to you, 'I know this club is going to red-dog because I heard all about it in meetings, and I know that if player Y plays here, it's a red dog; if he plays there, it isn't.' That's not the way it works, because player Y knows as much about it as I do. You have to be in the league a long lime and remember things, and at last you get a feel about it. If you could learn it by studying movies, a good smart college quarterback could learn all you've got to learn in three weeks and then come in and be as good as the old heads. But they can't Because you look at seven or eight different teams each year and they have a different feel and a different look, and you have to learn to look at them and know this is this team and Night Train Lane is the corner back and I better not throw anything into the flat on his side. Because I know he comes up quick and he can pick off the flat pass, and if he does we don't just lose the ball. We probably lose six points, too." In a game where the rule now is preconceived strategy—the careful, long, thought-out game plan that makes small allowance for the idiosyncrasies of individuals—Tittle is an individualist. "It's changed a lot since I came up in 1948," he said. "It's changed a lot since 1953. You spend 10 times as much time on preparation. You go over defenses and reactions and keys and how you read. You learn little things about the other team, or about certain players you didn't even consider 10 years ago. But you ask me how it's changed, and it isn't that so much. I have to think about it, because I want to say it right. I want to get the meat of the change in what I say." He thought of the meat of the change, his blue eyes peering seriously from deep in his bony cave of eyebrows and cheekbones. "Maybe it is this," he said at last. "With all the preparation, the defensive units play as teams. It isn't a question of individual effort, but individual effort goes into it. What I mean is, everybody on the defensive team has a job to do, and they do that job first. They do what they're told to do, what they're coached to do. So you can't count on one guy's personality. You can't count on a corner back playing too tight in one situation, too loose in another. He plays where he has been taught to play. And they all play longer. So they get better, playing longer." Tittle's own team is a good example of what he means. The two Giant units—offense and defense—have played together for three or four years, with few exceptions. Tittle himself is a latecomer, but he fits in with the Giant veterans as smoothly as a replacement part in a Cadillac. He runs the Giant team confidently and with almost no help from Allie Sherman on the sideline. When the Giants won a crucial game from the Cleveland Browns recently, Tittle, using that clear knowledge of defenses and defensive personnel he has built up in some 15 years in pro football, called audible signals through nearly all of the first half of the game as the Giants conned Frank Ryan and jimmy Brown and pulled away to a big lead. "Sometimes the defense changes radically," he said. "Maybe you expected an even line, and they're in an odd one. Or maybe I look at them and read blitz and check off." Tittle is one quarterback who is not often harried by blitzes, principally because he recognizes them quickly and because, too, he is probably the most adept quarterback in the league at throwing a screen pass, which can destroy a blitzing team. "You learn to look for little things," he said. "Not obvious things like the linebacker coming right up on the line of scrimmage. But say my tight end is split out a little, maybe four yards from the tackle. The corner linebacker should be right out there with him, playing right in front of him so he can chuck him at the line. But if he has cheated into the gap between the end and the tackle, I read blitz. Or maybe the weak-side safety is intent on the A back—the offensive back on his side. Instead of being relaxed and at ease, he's crouched over, and maybe unconsciously he's moved a step or two closer to the line of scrimmage. I read blitz again. That means the weak-side linebacker is coming. He's the man who would take the A back in a pass pattern, and the weak-side safety is going to have to cover for him, so I read blitz from the way the safety is acting." At 37, Tittle is a remarkably sturdy quarterback who, luckily for the Giants, is seldom injured. He knows no magic for avoiding injury, but the football lore stored in his bald head has its protective uses, too. "Let's go back to that weak-side safety," he said. "Say I read blitz. I know where the linebacker is coming from. Maybe I was going to release two backs from the backfield. I'll keep one in on that side for extra protection, and I'll be very conscious of pressure from that side. But, actually, getting hit is still getting hit. I don't know any way to make it easier." The Tittle instinctive approach to the art of signal calling makes him very difficult for opposing defenses to chart. All teams chart the frequency with which opposing quarterbacks call certain plays in various situations. Since Tittle himself is seldom sure what he is going to do next, defensive signal callers despair of outguessing him. Tom Brookshier, who was one of the best corner backs in football when he played with Philadelphia, and who is now a perceptive commentator on Eagle broadcasts, says, "I couldn't guess with Yat when I played against him. With some quarterbacks, in particular situations, I could take a chance, gambling maybe on a quick look-in pass, and be out of position enough for an interception. I couldn't do it with Yat. I can't guess with him now, either. Working in the booth, I call plays with the quarterbacks in my mind, and with most of them, I hit four out of five. With Tittle, I'm lucky to go one for five." Tittle was originally drafted by Cleveland in the old All-America Conference. Luckily for the rest of the NFL (imagine Y.A. and Jimmy Brown on the same team), the Browns traded him to the Baltimore Colts. He came to the Giants after three years with the Colts, 10 with the San Francisco 49ers. His quarterbacking technique is peculiarly his own. He makes his fakes with both hands on the ball, unlike many quarterbacks who fake the hand-off with one empty hand. ("I want to show the defense the ball, not an empty hand," he says.) On pitchouts, he snaps the ball out from his belt buckle, again with both hands. Most quarterbacks pitch out with one hand, using the long, underhand motion of a softball pitcher. "I may get hit pitching out," Y.A. says. "If I've just got one hand on the ball, I'm more likely to fumble. And I have better control of the ball using both hands." Even in running the bootleg, where the quarterback fakes a hand-off to a running back and then sets off on a perilous journey alone around the flank, depending entirely on deception, Tittle operates in his own unique way. Bob Water-field, the former Ram quarterback, was a masterful actor in this play; his hand-off seemed absolutely real, and he would then trot back casually from the play, watching the faking back, holding the ball casually against his hip away from the line of scrimmage. His acting was so good that he was usually overlooked until he broke for the goal line. Most quarterbacks since then have tried to emulate him, but not Tittle. "I work against the grain of the defense," he said. "If they are going to play me for the bootleg, they have to violate everything they have been coached to do. I call a play which has the tackle blocking down with a fake toward the middle. The defensive end has to read, run and close down. I make a sloppy fake and take off outside the end as hard as I can go. I'm going against the grain—the defense is going one way and I'm going the other—and they have a hard time changing direction. But if it doesn't work, I'm out there naked, and we lose ground." Tittle's throwing style is his own, too. He holds the ball with his fingertips, no part of his palm touching it. Throwing and accuracy are instinctive; he can't explain why he is accurate or how. "It's something you can do or you can't," he says. "It's like a pitcher's control." In the off season, Tittle is a partner in a successful insurance agency in Palo Alto, but he is far from ready to retire from football. "I'd hate to have nothing to do but sell insurance," he says. "But I do like selling," he hastens to add. "It's like football in some ways. You learn a presentation and work on it until you know it cold. Then, after 15 or 20 years you begin to know what you're doing. You know when a prospect is ready to sign, how to move in, what to say. It's the same as football." He has some built-in prospects in New York in the Mara brothers, who own the Giants. He's the best insurance they have for another Eastern Conference championship.